It looks like the rumors were true, HTC is building some sort of wearable device, and it'll launch before the Christmas shopping season begins. "Many years ago we started looking at smartwatches and wearables," confirmed HTC Co-Founder and Chairwoman Cher Wang in a Bloomberg interview. "We believe that we really have to solve the battery problems and the LCD light problems. These are customer-centric problems." Although she didn't specify the type of wearable, her first mention of a "smartwatch" matches last fall's report that HTC was developing an Android-powered watch. Until today, HTC was just about the last major manufacturer without a wearable device either on the market or in development, and it didn't have any wearable to show off at CES 2014. The Taiwanese manufacturer has some catching up to do. 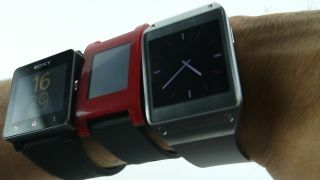 LG impressed showgoers with its LG Lifeband Touch device and Sony Core looked just as promising. Samsung is already selling its first of many smartwatches under the Galaxy Gear brand, and the Pebble Steel just went from Kickstarter kids toy to night-on-the-town stylish. Fitness-focused wearables are also gaining popularity as unlosable pedometers, including the Fitbit Force, Nike FuelBand SE and Jawbone Up. Garmin has a new Garmin Vivofit and Razer's Nabu is coming soon. And there are almost daily rumors of an Apple Watch and Google smartwatch being circulated. Google is already turning heads with its cyberborg-like Google Glass. HTC, known for its well-designed, full-metal HTC One smartphone, could outclass the competition with a more fashionable smartwatch that interacts with its next smartphone codenamed the HTC M8. Read: HTC One 2 leaked again - is it enough of an upgrade?